This year’s meeting of the G20 will take place in the heart of Hamburg, or, more precisely: at the trade fair halls (Messehallen). A lot has been written about the background to this choice, for the sake of keeping a better overview we won’t repeat it all. Nevertheless it is worth saying that this will be the most interesting and most exciting, but also most exhausting days for the radical left in Hamburg for a long time. This event will definitely outclass Bambule and #2112. Whether this will be positive or negative, we don’t want to judge here, this also lies in the eyes of the beholder. The sabre-rattling on the side of authorities and police has long since started. There is massive armament taking place, special units of riot police for securing evidence and making arrests are being equipped with machine guns, new tanks are being purchased, 20,000 cops in town, there will be bodyguards of a wide range of governmental leaders armed and potentially trigger-happy, there are warnings of casualties and the entire event is happening just within spitting distance of our neighbourhoods. Theoretically, all of this should be enough to justify taking to the streets, but the root cause of the whole charade should not be ignored or get lost amongst the fuss: the G20 are claiming themselves to represent a majority of the world’s population and are pretending to sit down together in the interest of these people. It is beyond doubt, however, that this meeting is much more about geopolitical interference, the maximization of profits and the exploration of new capital markets – this is simply what the neoliberal system ensures. 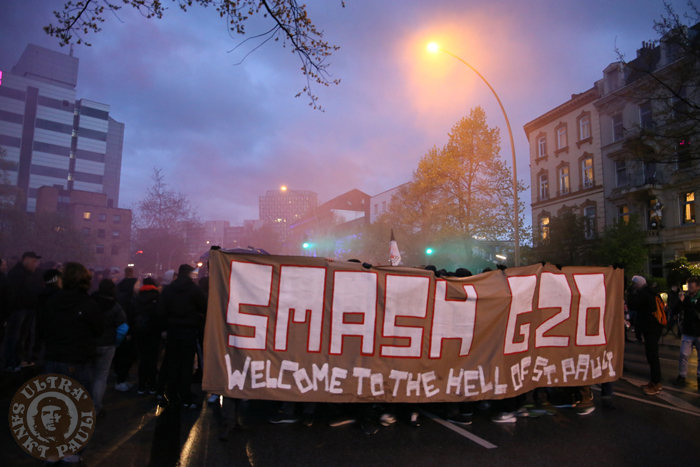 On 6 July at 16hrs, the „G20 Welcome to Hell“ demonstration will kick off with a manifestation at the Fish Market (Fischmarkt). There are rumours that the announcement of the demo is already bringing beads of sweat to the Senate and the heads of police operations – whilst the autonomous movement is chomping at the bit. Despite all pre-operation assessments on the side of the police, including various nightmare scenarios, we will not be scared off and will go out and protest, for a leftist perspective and for a fair world. Wearing muted colours is recommended. Two days later, on Saturday 8 July, more people than ever before will take to the streets in the City Centre under the motto “Solidarity without borders instead of G20”, to speak up together, against the current conditions, this type of politics and their self-proclaimed “Rulers of the World” with a variety of actions: ranging from environmental federations to unions and autonomous groups, from parents’ associations to religious groups and political parties. This protest will be massive and diverse to an extraordinary exten, both with regards to the range of people and the themes represented. For more than 25 years, we have also been fighting for values within our club and within our fanbase. We have shown that another kind of football is possible and our commitment has never stopped at the stadium exit gates. Based on solidarity, FC St Pauli as a club itself, is representing a counter-model to the world of the G20 leaders and the misery produced by global capitalism as well. All St Pauli fans are therefore invited to join the St Pauli section at the major demo of various alliances on Saturday. You will recognize the section via the flags in brown and white. Together we will represent our club and will add our colours to the wide spectrum of protest. We thereby want to provide a point of contact for all St Pauli supporters who want to march together. Stand up for your opinion! Make your opposition heard! A better world is possible! Apart from that, it is recommended to re-read „What to do when the going gets rough?” from the Rote Hilfe (Red Aid) which fortunately is available in different languages. There you can find useful legal tips for demos and for dealings with the state authorities. ¿Qué hacer cuando la cosa se pone caliente? Τι κάνουμε όταν ο κόσμος γύρω καίγεται; Κρατάμε την ψυχραιμία μας! Turkey is getting through a political chaos, due to street wars happening in eastern Turkey. After peace process collapsed, government started a new phase of war in the whole country. Now, we are facing with this new phase in the stadiums. Amedspor, a team from Diyarbekir (Amed is the Kurdish name of the city), played against Istanbul Basaksehir, a team backed by government. Even with the 3 division difference between two clubs, first game ended with a draw even with the 2 red cards of Amedspor. On 28th of January, the second leg of the match-up took place in Istanbul and we attended the game as Vamos Bien also with our friendly group Barikat from Amedspor (Barricade in Turkish). Before the match, in addition to the traditional precautions, they asked supporters’ Identity numbers, they checked two times from shoes to deeps of your clothes. Inside of the stadium, there were riot-polices in everywhere included the away supporters’ watching areas. During the match, we were with special ‘sport bureau’ employees of police next to our seats. In the match, in addition to the great effort by the referee to stop amazing play by Amedspor, referees didn’t end the match until Basaksehir scored the second goal in the extra times to catch equality. After this score, two Basaksehir players came in front of Amedspor supporters and made a formal military salute to us. These salute was in purpose of tensing us up. After the match, police made us waited inside of a narrow corridor and pushed us more and more. After waiting for a while, they allowed us to leave stadium one by one. We realized the reason behind that was to check the faces of fans and put us under arrest. Now, tens of our friends have taken into custody. Surprisingly, they are not in the sport bureau of police, but counter-terror branch. Against all rights according to the law, the members of Barikat has been faced with violence by the police. They have been charged with “traitor to the state, membership of terorist organisations”. Members of Barikat has always been sensitive about one fact: Supporting only football team Amedspor, no direct slogans that can be used for provocation. Freedom for Barikat members! Freedom for Ultras! that St. Pauli stands shoulder to shoulder with the refugees within the group „Lampedusa in Hamburg“ became abundantly clear, at the very latest, following the Sandhausen match. Nevertheless it is important that we do not allow our support for them to fade away. With this in mind, we have decided to make the match against Cottbus (11th November 2013) an Alerta Action-Day under the message of „Refugees welcome“. Make sure this message is there for all to see in the Stadium. Bring flags, paint banners and get songs and chants going! Because solidarity also means understanding, we have planned a second part of the Action-Day for Tuesday evening. We have invited a representative from the group of refugees to attend this event, to tell more about the situation, as well as answering any questions on the subject. We will also be showing the film „Lampedusa auf St. Pauli“ by Rasmus Gerlach. So come along on Monday the 11th November 2013 (for the second half), bring plenty of banners etc to the match, take part in the Action-Day and come to the Information Event in the “Fanräume“ on the 12th November 2013 at 19:00 hours. dass St.Pauli hinter den Flüchtlingen der Gruppe „Lampedusa in Hamburg“ steht ist nach dem Sandhausen Spiel mehr als deutlich geworden. Trotzdem ist es nun wichtig, dass unser Engagement nicht abebbt. Aus diesem Grund rufen wir zum Spiel gegen Cottbus zu einem Alerta Actionday unter dem Motto „Refugees welcome“ auf. Macht das Thema an diesem Tag in der zweiten Halbzeit (Montag 🙁 ) im Stadion präsent. Bringt Fahnen mit, malt Tapeten und stimmt Gesänge an. Weil Solidarität auch heißt, dass mensch sich kennt haben wir für den nachfolgenden Dienstagabend den zweiten Teil des Actionday geplant. Dazuhaben wir aus den Reihen der Flüchtlinge eingeladen, um sowohl über die aktuelle Situation zu berichten, als auch Fragen über die Flucht beantworten zu können. Außerdem werden wir vorher den Film „Lampedusaauf St.Pauli“ von Rasmus Gerlach zeigen, welcher auch Vorort sein wird. Kommt also am Montag, den 11.11.13 mit zahlreichen Materialien zum Spiel und nehmt am Actionday teil und schaut am Dienstag, den 12.11.13 ab 19:00Uhr bei der Infoveranstaltung in den Fanräumen vorbei. Deeply concerned, a lot of us see several hundred African refugees being left behind by the City of Hamburg for weeks. 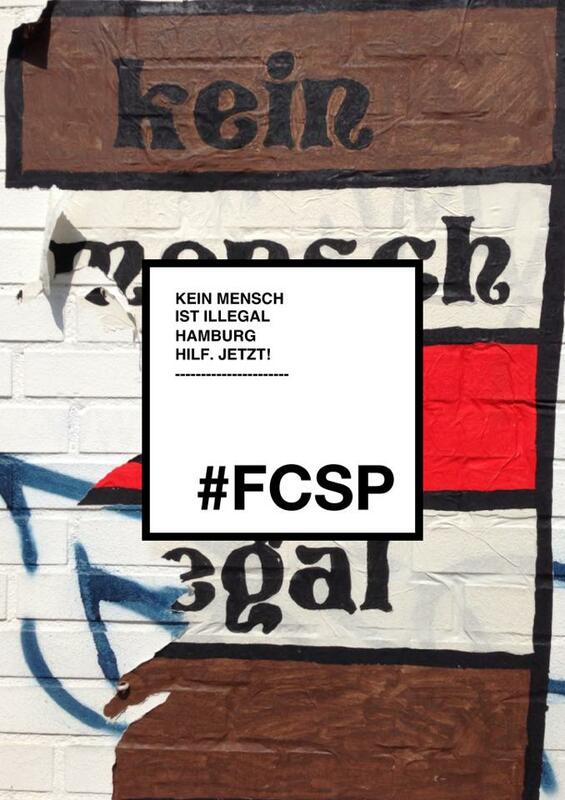 We, a group of supportes of the FC St. Pauli, are willing to gather our powers to help these refugees with their struggle for a save stay in Hamburg and a better life. For a long time the Hamburg Senate fails in its responsibility of being the government of one of the richest cities in Europe and support those people who fled from a civil war with little more than their own lives. That is not our Hamburg! Whatever we can do, we will help. Therefore we urge all Hamburg citizens to get up and join us. At the moment, we are networking with the refugees themselves, with antiracist initiatives, with the churches, and with other important institutions to build up a proper plan. All you people who don’t turn a blind eye to the fate of the refugees should follow these wires. We will shortly name the possibilities how you can show your solidarity and support. We also ask the intitutions and comittees of the FC St. Pauli itself to help where the people concerned and the supporters need it. 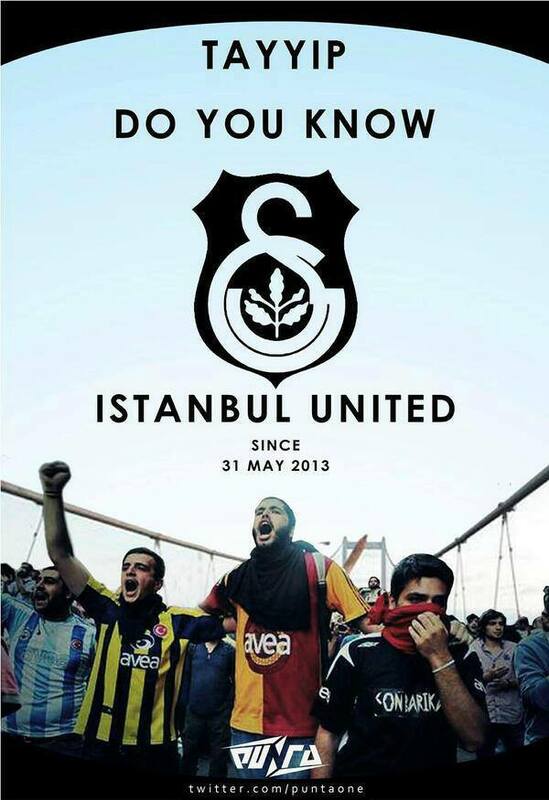 Information about Istanbul riots and football fans unite! As you may know, Istanbul has been on fire since last monday. Since government-supporter media(„assholes“ as Kurt Vonnegut said) has been ignoring the riot, it would be so helpful if you spread our word among footbal fans over Europe. It all started as defending a little park in Taksim called Gezi Parki (they are trying to shopping mall and residence here for big companies). After police and the prime minister Erdogan’s dictatorship-like speech, with all colours of people started a riot in Taksim and then it spread to Kadikoy and other cities. We are minority but we still have a dream about country. 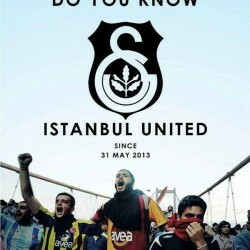 Good news, all rival football teams‘ supporters united and took the leadership with political movements along the riots. VamosBien called all Fenerbahce fans to barricades and thousands of fans came. We came from barricades for a little rest and we are turning to barricades again soon. PS: GOVERNMENT IS CUTTING INTERNET CONNECTION AND SOCIAL MEDIA CHANNELS AROUND TAKSIM. SO IT IS SO IMPORTANT TO USE OUR VOICE AS MEDIA.